An infectious or inflammatory response with ongoing ulceration or granulation on the superstructure of the arytenoid cartilage. Here we are talking of the arytenoid cartilage and/ or its thin “envelope” of fibrous tissue called perichondrium. The root chondr- refers to cartilage. 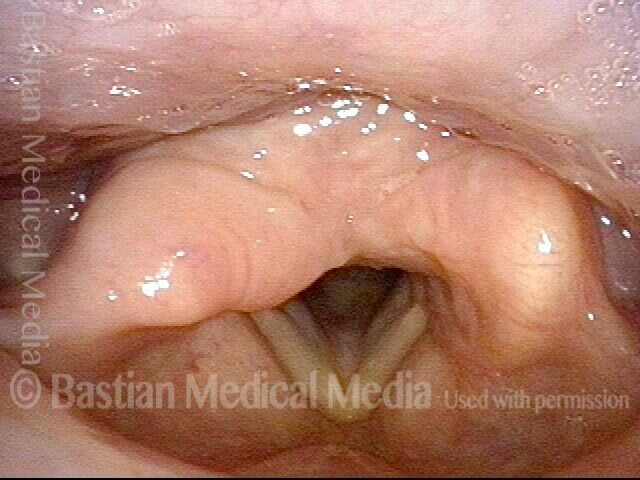 A similar and much more common disorder, contact granuloma or contact ulcer, occurs on the medial surface of the arytenoid cartilage, but low and at the level of the vocal process. When arytenoid chondritis or perichondritis occurs, it causes significant chronic pain (in contrast to contact granuloma, which can be pain-free or bring only minor discomfort). We have never diagnosed the underlying cause. Treatment tends to require definitive removal of the area of cartilage involved (not the entire arytenoid, of course), and then typically the area will heal, though often only after a time of re-granulation. Festering arytenoid chondritis of over a year's duration. Several biopsies done elsewhere showed only inflammation. Two weeks after aggressive partial arytenoid superstructure excision, in an attempt to get down to healthy cartilage. After complete healing. Note loss of anterior arytenoid prominence on the operated side as compared with the unoperated side. At this point, patient is entirely symptom-free. Notice resolution of the lesion and inflammation. The arytenoid mound is a little lower on right (left of image) than on left (right of image), due to surgical removal of part of the superstructure of the arytenoid. The area of festering chondritis has completely healed. The arrow shows center of where the lesion was. This person has twinges of pain every time she swallows, like “ground glass” or “razor blades.” She locates the sensation by pointing precisely to the upper part of the thyroid cartilage on the left. The exam reveals an arytenoid ulcer (upper right of image), with surrounding erythema. A closer view shows more clearly the central depression and rolled border of the lesion. Using narrow-band illumination at even closer range. Small ulcer with surrounding erythema, right arytenoid superstructure. Two weeks after dilation of this inflammatory subglottic stenosis. Treatment elsewhere with esomeprazole for 2 years had not resolved this. This is likely forme fruste Wegener’s-type stenosis, which in this patient has required dilation every few years, with marked resolution of shortness of breath/ noisy breathing. There was no postoperative pain at all until on the 4th postoperative day, when she developed left throat pain radiating to the left ear. Note within dotted line a flat ulcer with surrounding redness, resembling an apthous ulcer more than endotracheal tube injury or acid reflux. Observation was counseled, and even discontinuation or reduction of her esomeprazole. Within a few weeks, the pain resolved. Here, 3 months later, the ulcer and erythema are gone. Dotted lines indicate where the ulcer would be if still present. Compare with photo 2. 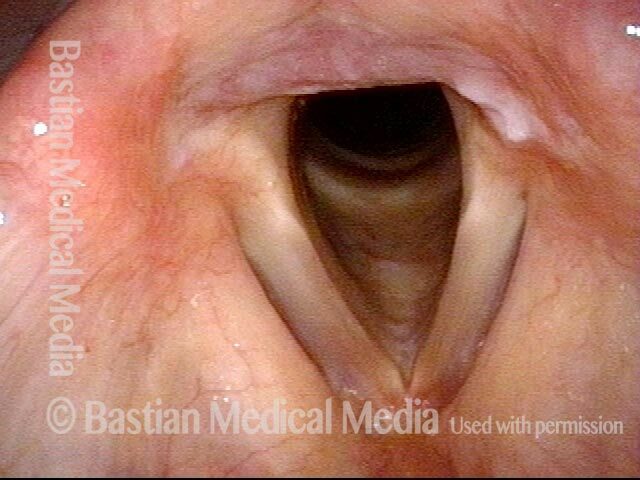 Singer with constant right throat pain and vocal impairment, worsened by singing and speaking. Examination finding: arytenoid perichondritis. Note the erosion exposing the arytenoid cartilage, and the associated swelling. 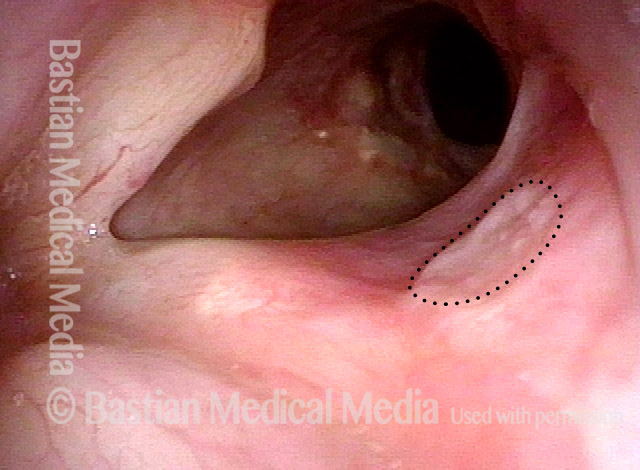 Swelling creates a “pseudopolyp” (at arrow) that interferes with vocal cord closure and vibration. Phonatory view under strobe light. Two weeks after antibiotic treatment. He has intermittent mild discomfort only when singing, and his voice is much improved. Minimal residual erosion (see arrow), with mild inflammatory changes. 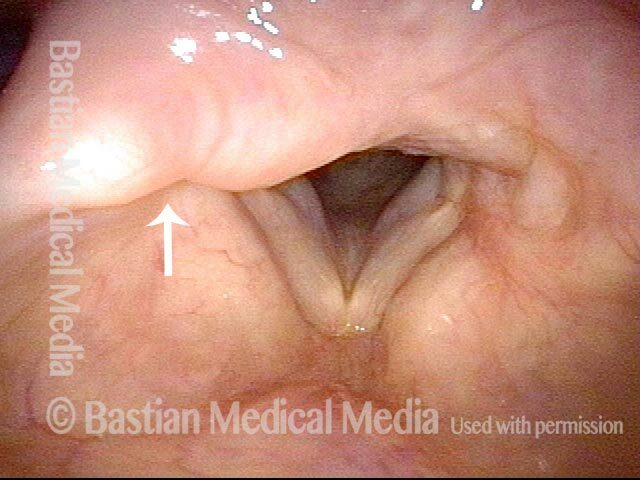 Pseudopolyp has resolved and no longer interferes with voice. At follow-up 6 weeks later, his voice is entirely normal and he has no pain. 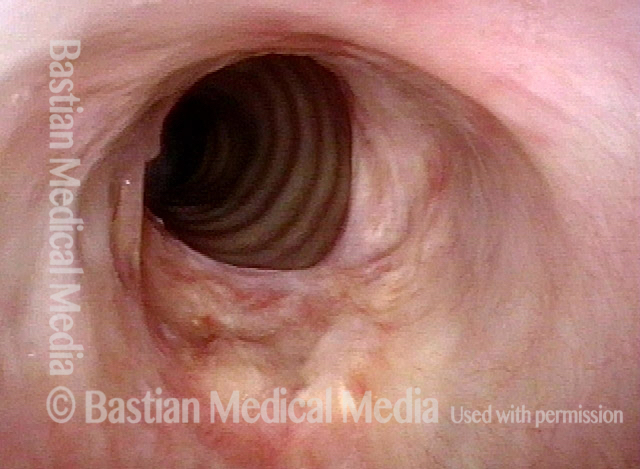 Spontaneous onset of sore throat, laryngitis, without any other URI symptoms approximately 6 months earlier. Biopsy elsewhere showed 'acute and chronic inflammation.' Note the inflamed, rolled border outlined by dotted line, and a sense of central excavation. At closer range. The solution here will likely be to remove the lesion to include a central "festering" area of perichondrium, as for the other cases on this page. Cause of this kind of lesion is always unknown. Very localized throat pain, left mid-neck, has been present for about 5 months with no sign of improvement despite trials of antibiotics, and fluconazole elsewhere. The location of pain correlates well to the lesion (bold arrow). The pain is very troublesome, fluctuating between 5 and 7 on a ten-point scale, worse with talking and tending to increase as the day progresses. The patient was also experiencing frequent laryngospasm. The patient was offered further observation vs. excision at her option. After waiting an additional month, the patient became motivated to have the lesion removed. This examination is one week after excision of perichondrium and a small amount of cartilage, seeking to remove the “festering point.” The surgical wound is indicated by small dotted line on the left (right of photo). The patient’s pain is already much reduced, in spite of this wound, but peculiarly, she now has just a slight similar pain on the right. Note the small lesion indicated by the arrow, and visible in retrospect, in photo 1. Five weeks after surgical removal, left-sided pain is still gone, and after a course of antibiotics and steroids, right sided lesion (arrow) and pain are nearly gone. It is not known whether healing was spontaneous or the result of steroid and antibiotic. This is because treatment of longstanding lesions often fails, and early, minimal lesions like this one sometimes heal without treatment. 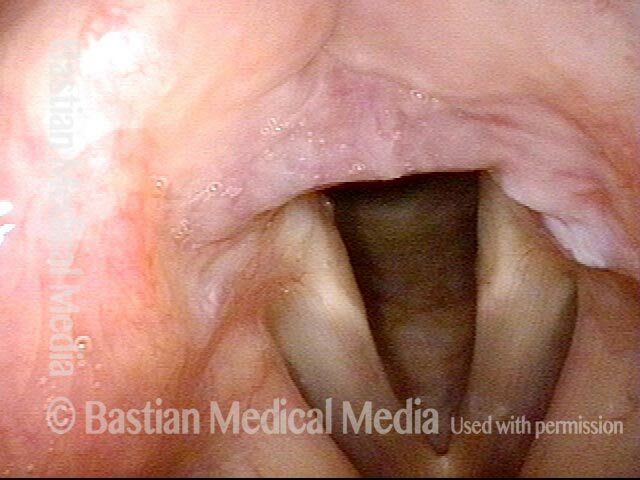 Now 3 months after surgical excision, the larynx is entirely healed; pain and laryngospasm are gone.